I recently started watching Hunter X Hunter anime and it gave me some ideas for a way to add some challenge to an RPG. The first arc was about the character taking the Hunter exam, first proving their worth to even take the exam up to the challenges they are facing. The challenges vary based on the test giver, some testing physical ability while others focus on specific skills or even character of the test taker. RPGs with testing is not a new idea at all. 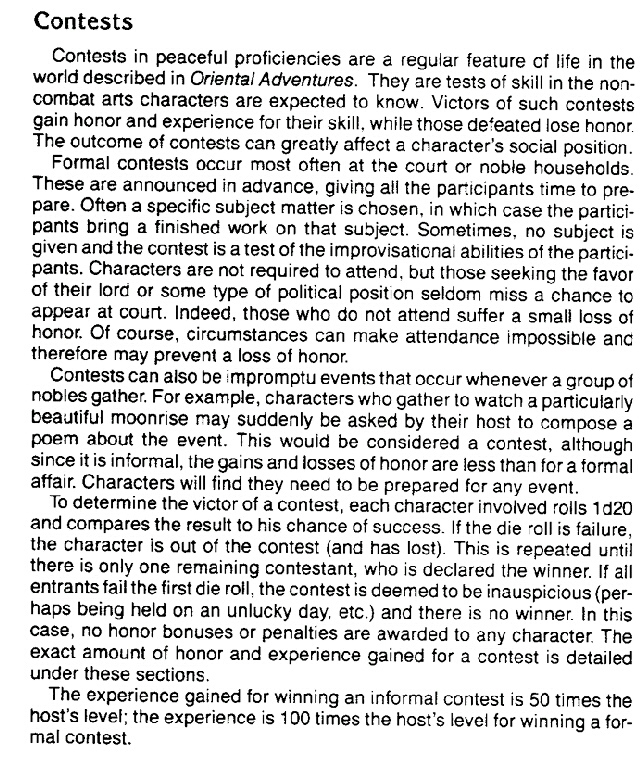 Dragonlance had the Tower of Sorcery with a test for magic users to prove themselves worthy and able to get powerful magic and AD&D Oriental Adventures talked about doing contests with non-weapon skills like poetry and horseback riding as used to happen in Japan. My I Say Noh post shows the example of how secret tests of character can sometimes even take on a life of their own. Star Trek: The Next Generation episode Coming of Age was an episode about Wesley Crusher joining Starfleet and thus having various tests. Ender’s Game is a more recent example, where you can see that everything is a test. The Recruit uses this line in it as well, and the amount and sort of tests show a lot of variety. Tests are not all about just the achievement of the task because sometimes it is more the way you achieve the task. Not every challenge you present are going to be solved in the way you predict they will. Domino Squad in Star Wars: Clone Wars Season 3 is a perfect example of this in Clone Cadets episode. In the tests you present to your PCs, you want this sort of approach, where you can measure them on many points. I like referencing the Ultima Personality Test as an example of this, since any answer is right. Some may help people, others may attempt to reach their own goal without acknowledging other people’s suffering, others will be more willing to help if they can get a benefit. All of them are beneficial for the player, so all are valid paths they may take. You just choose what they get rewarded for. In the end, it is the reward that makes it all possible. This video spells it out, but basically it is Pavlovian, as you reward the behaviour you want and players will do it more. They will do it even more if it is an exclusive reward they cannot get elsewhere, such as mentioned in this Days of High Adventure article. Many video games do this with ‘expansion packs’ and ‘mods’ that include a ton of items or costumes or other things that add to the game but do not completely break it. Why not add something like that at your table?